The dream started to come true in 2002, when the restoration of the edifice built at the beginning of the 20th century commenced, with much love and care. 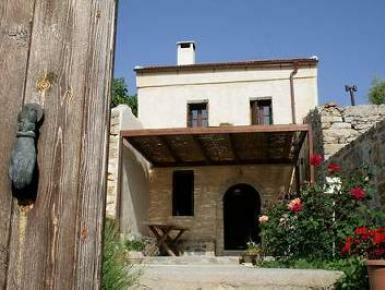 As simple as that, the guest house was created at the top of the village Smari, at the location Arhontika next to the old school. It is named after the wonderful view that someone can enjoy from the guest house, as the side of the mountain across is full of oaks, commonly called drides or adriades in the folk speech. The lodging has been restored with stones from the area, and its roofs are mostly tiled. The two bedrooms are accessed from different stairs. The smaller one has the old iron bed of grandma, whereas the lantern lets you enjoy the beautiful sky at night.